Five years after the Supreme Court’s 2010 Citizens United v. FEC decision, what are the roles of large donors and average voters in selecting and supporting candidates for Congress? This report examines the role of money in the 2014 con-gressional elections from both quantitative and qualitative perspec- tives, and demonstrates how matching small political contributions with limited public funds can change the campaign landscape for grassroots candidates. $3,300 every day for six years to match the contributions collected by median 2014 winner; House candidates must raise $1,800 every day of their two-year cycle. 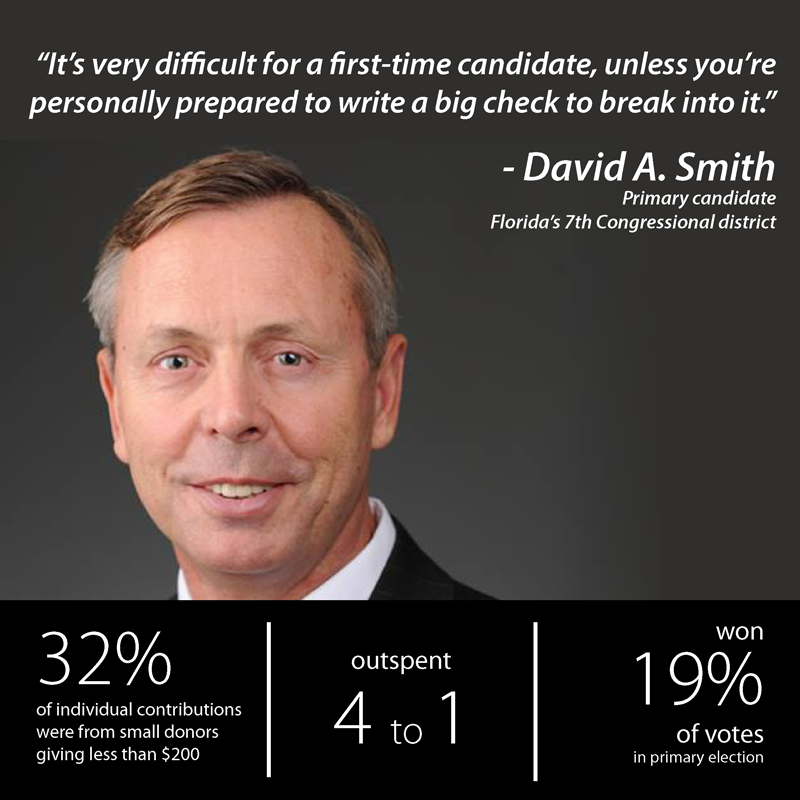 • Relying exclusively on small donors, Senate candidates would have to secure at least 17 contributions every day and House candidates at least nine in order to keep up. than 86 percent of the funds they raised from individuals in contributions totaling $200 or more. 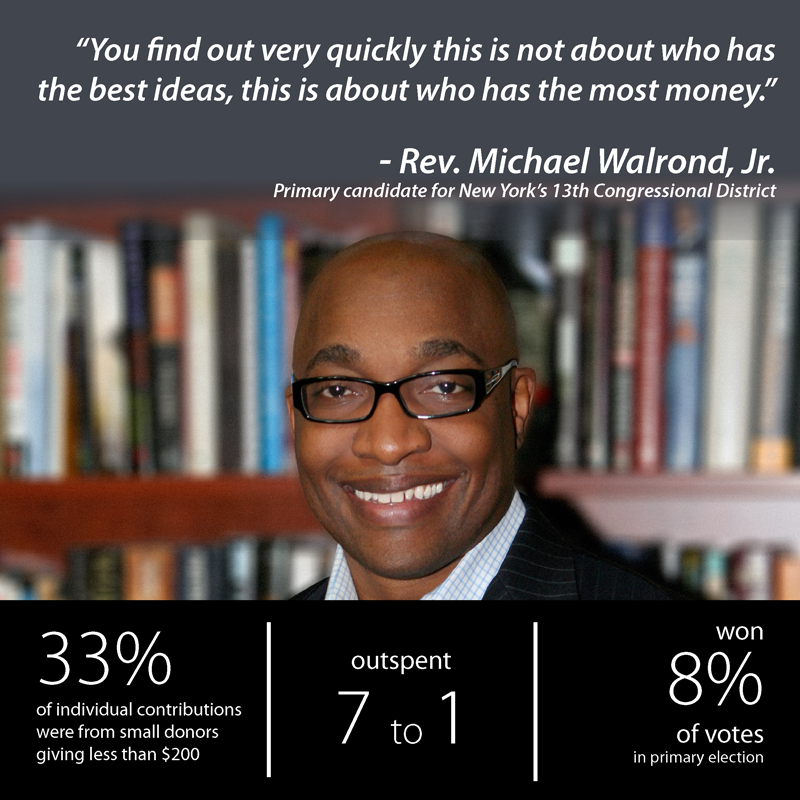 • This big money system filters out qualified, credible candidates who lack access to large donors. Four of these candidates are profiled in the pages below. • A federal program matching small contributions with limited public funds would have helped the profiled candidates compete more effectively against their big money-backed opponents by substantially narrowing the fundraising gap. 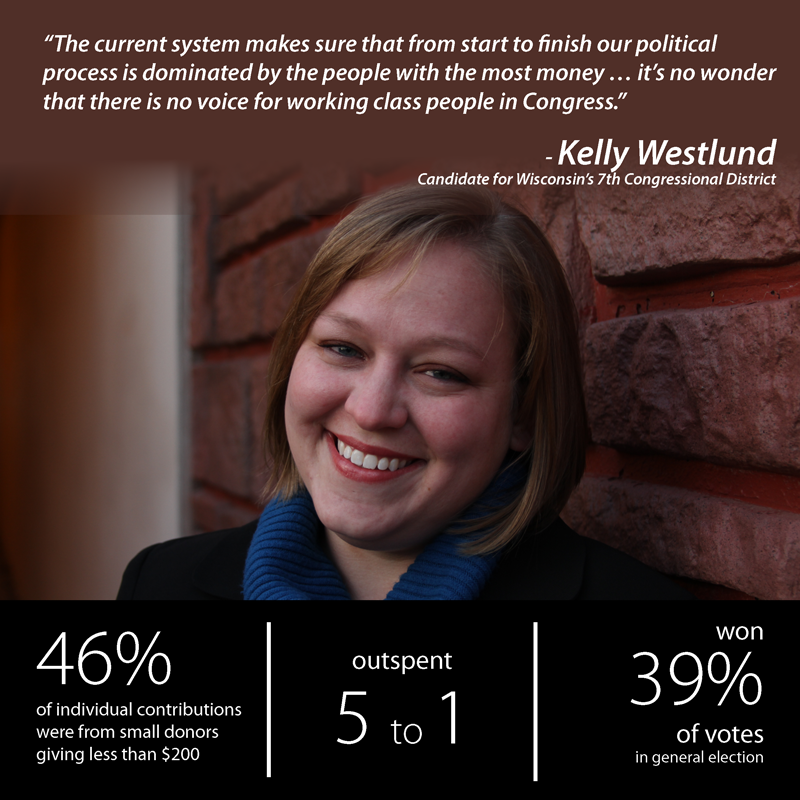 One candidate would have raised significantly more money than her opponent if a matching fund program were available. The other three candidates would have narrowed the fundraising gap by an average of more than 40 percentage points. More importantly, they would have had significantly more resources to get their messages out and hit the minimum threshold for running a competitive campaign. And, they would have been able to do so raising two or three small contributions each day asopposed to the nine or more they currently need to keep up.